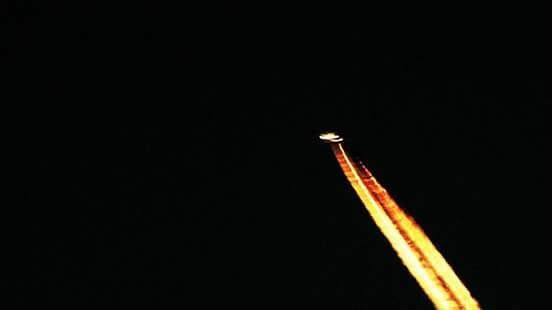 A ‘flaming UFO’ has been spotted soaring above Exmouth in Devon. At least that’s what this musician claims he saw shortly after 1pm on Wednesday. According to Mark Emmins, the oval-shaped luminous object appeared in the sky and remained there for about three hours. His friend, Tyron Osborne, snapped the rare sight as the pair looked on in amazement, convinced it was a UFO. Posting pictures online, Mark wrote: ‘Today for the second time in my life I can honestly say that myself and my neighbour watched a UFO. The object, which is most likely not a UFO, was initially dismissed as a star, but Mark insists he later windows on it. He said: ‘If you look closely you can see what appears to be windows. I have never seen anything like this. ‘As for believing in aliens, I’ve always thought we are not alone in the universe and hoped to see something that would make me believe they would visit us. Mark believes the object came from the US after he noticed it was traveling east from Dawlish. His post led to dozens of people speculating at what it could be, with most people saying it was probably not a UFO.